Figure Skaters Online caught up with 2018 U.S. National Champion and Olympic Team Bronze Medalist Bradie Tennell before she performed for a hometown crowd at the Chicago stop on the Stars on Ice tour. 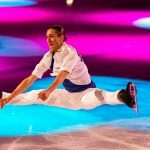 Figure Skaters Online (FSO): What is it like being on your first Stars on Ice tour? Bradie Tennell (BT): It’s been a lot of fun. Being on the road all the time is a lot more tiring than I thought it would be, but it is so much fun. It is nice to have other people on the ice with me, because not every single tiny little detail needs to be perfect. Learning how to skate in a formation was quite the task for me. I spent the first two or three days of rehearsals completely on the other end of where I should have been, because you don’t have to push as much or skate as fast. I never even did synchro as a kid, so it was something that I had to catch on to pretty quickly. FSO: What is the atmosphere on tour like? BT: It’s been really great. There is a very good sense of camaraderie among the cast and everybody’s been super nice and super welcoming. FSO: Now that you are a few months removed from the Olympic experience, what does it mean to you? BT: It means everything. It was such a crazy, crazy experience, but the most fun I’ve ever had in my entire life. On Thursday (April 26), I was in DC for the Team USA Awards, and seeing some of the friends that I made at the Olympics and seeing the videos brought back all these feelings, that feeling in your chest, the awe. It’s just incredible. FSO: What was your most memorable Olympic moment? BT: Getting my medal. It was incredibly cold. It was outside, up in the mountains, so we were standing there frozen. It was everything I dreamed of and more. Being able to stand there on the stage and see the American flag going up the pole, it’s indescribable. It was amazing. BT: It was everything. It really felt like it shouldn’t have been any other way, because they’ve been by my side for everything else. My entire journey, they’ve been there by my side, so it only felt right to me to have them there for the destination. FSO: How are your preparations for next season going? BT: I’m starting to think about getting ready (laughs). It’s been quite a process, because I haven’t had a lot of time. I only had four days between Worlds and the Stars on Ice rehearsals, and two of those days were spent traveling. So I really haven’t had a chance to rest at all. I have a little bit longer of a break this week, because I don’t have to fly home tomorrow morning. I’m looking forward to taking this week to relax a little bit. Check back on Bradie’s official FSO website later this summer for more details about next season and her music choices!